The energy extremes of the last quarter of 2015 have continued through this quarter and it has been a challenging period with extraordinary time demands. But all is returning to "normal" and here is the Spring, 2016 newsletter! And happy Solstice in two weeks! As I have said in many of my write-ups about lightning strike quartz, I generally begin by saying that quartz is piezoelectric. Piezoelectricity means electricity resulting from pressure and it is not just exhibited by quartz, but crystals like topaz and tourmaline as well. And interestingly and as an aside, bones are also piezoelectric and they constantly generate electricity as you put weight on them. This electricity is critical for maintaining the calcium content of the bone and the reason why it is essential to maintain weight-bearing exercise as you get older. Exercise has been shown to prevent or reduce bone loss and piezoelectricity is why. DNA is also piezoelectric thus making it possible to direct the genetic code critical to each species on earth. You can learn more on Wikipedia. That aside, piezoelectricity has been utilized in many devices ... the quartz in your watch is one and speakers are another. Have you ever taken a wintergreen Lifesaver and bitten down on it just to see the spark? Do it in a dark closet and the light will astound you ... piezoelectricity! So many things create the pressure that induces the electrical current ... sound, heat, light, energy ... even the energy and heat from your hands will stimulate it! Another interesting thing is the famed Russian Blue Angels Mine where the Russian Lemurians were found. At night, this mine was known for its blue lights ... these scared the miners, causing them to quit as they attributed the lights to demons or malicious ghosts. The clever owners of the mine renamed it to the "Blue Angels" and told the miners that the lights were angelic in origin and that succeeded in helping to maintain them. But actually, it was not demons, ghosts or angels that caused the lights. The mine was in an area with quite a bit of tectonic plate movement causing the quartz to also move and respond to the pressure changes ... hence the blue lights! Piezoelectricity! 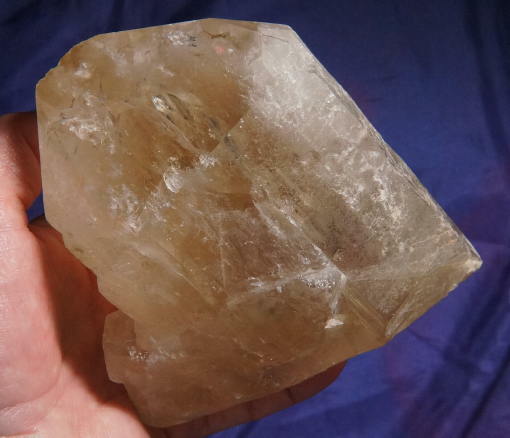 I can attest to all of this as after a particularly intense meditation, I went to place the quartz I was working with on the nightstand and as I did, I felt a pop and saw a blue flash. In my hand was a piece of the quartz that had popped out and on the side was the characteristic lightning strike pattern. 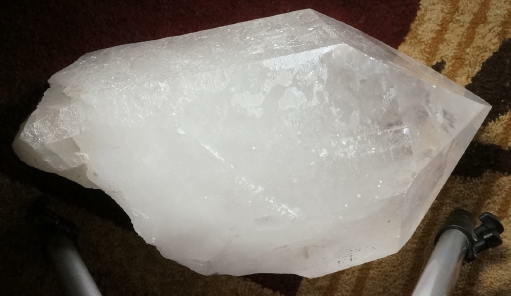 This crystal has since healed in the space of the 7 or 8 years since it has happened and she bares the scar of the meditation. 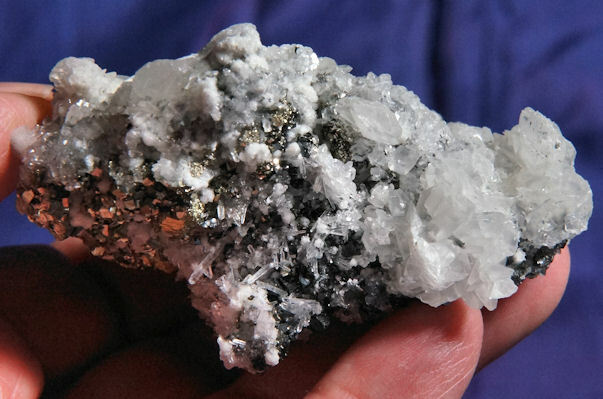 Beyond the zig-zag pattern on the lightning strike, actual lightning hitting the ground where there are large quartz deposits can also cause patterns on the crystals. The pattern may only appear on a few crystals in that deposit or most of them and any type of quartz may display lightning strikes. The lightning strike patterns vary and I have included pictures of a few of them. Sometimes, the patterns seem to dance across the surface of the crystal and leave points like a connect-the-dots puzzle. There are even what I call "scorch marks" that literally have a bit of a fogged, burned look where the current through them was small, but still enough to alter the surface. Other times, a side, face or termination will be literally blown out, while others have a more characteristic look. All these patterns display the nature of the energy that flowed that flowed through the crystal. Through the eons, ancient lightning strikes will heal and occasionally, you will have healed and fresh ones blended on a crystal ... these are particularly potent. 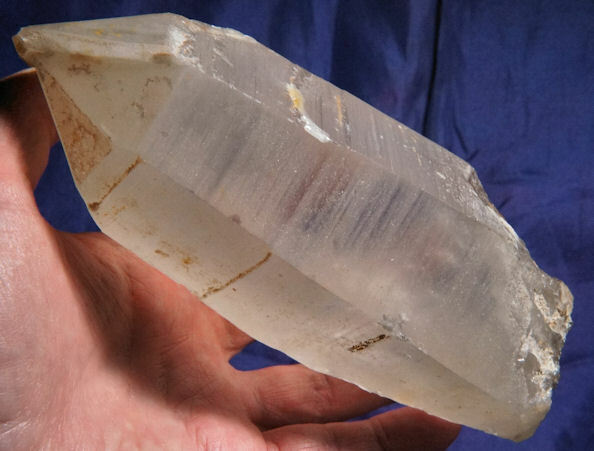 Many lightning strike quartz are starbraries and I feel that the Star Peoples used the piezoelectric qualities of the quartz to create the marvelous glyphs ... after all, quartz lasts and the record will be there for millennia for the people of Earth to decode. These are rare Spirits and truly are one of profound healing and change. Lightning strike crystals have accepted change to their core, even to the extent of allowing their structure to be changed and expressed more fully. Their energies effect us likewise, beginning with the Core. 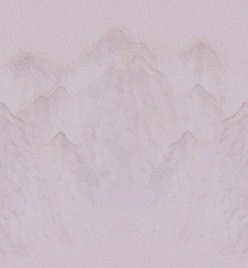 The Core Chakra is frequently ignored, under the assumption that all the other ones need work while this one is doing just fine. The Core is your connection to Self, family and community and as such is the vessel holding your Core beliefs ... the ones that guide your life. But, like the garden, the Core beliefs need weeding in order to remain strong and beautiful so from time to time, you need to align these with your stage of Spiritual advancement. As the Core is more directed and focused, the other Chakras can spin more freely. Fear is reduced and the expression of Self, life's work and heart opening are all realigned. You even find that your own Truth is revealed both to your Self and others. These special Spirits are loyal assistants in that quest to "fix" your energy balance. And while that fixed portion is important, equally important is the flexibility to allow those changes (and some will be hard to allow) and in that flexibility, deeply incorporate Spiritual growth to your foundation. The lightning strike markings further drive this home ... showing you that there is a definite path to follow to ensure the change ... and that often there are many ways. All that Spiritual growth is without merit if it does not become an integral part of your physical expression and complete you as a person - this is the one and premier Inner Truth! If lightning strikes sound like the "answer crystal", in a sense they are. For those who are ultra sensitive or working through a healing crisis, it will be good to also work with a calcite, rose quartz or even a red quartz to ease the transition and maintain your grounding. Lightning strike crystals are one of the most important, potent and incredible go-to crystals in your working group. Whenever there is a taxing issue like a relationship, healing event, difficult situation, etc., meditate with a lightning strike to bring clarity and focus to it. You will not regret your decision! This has been a gorgeous spring ... enjoy the summer to come!